A mountain rescue leader has spoken of the massive effort his team and two others put in during the search for the missing three-year-old boy Mikaeel Kular. Mikaeel’s body was found on Friday in Kirkcaldy in Fife, after a massive search involving volunteer rescuers and members of the public. Tweed Valley Mountain Rescue Team leader Steve Penny said 50 members of his team, Borders Search and Rescue Unit and Ochils Mountain Rescue Team took part in the search before the boy’s body was found. The Tweed Valley team’s help was requested by Police Scotland on Thursday. A team spokesperson said: “The team deployed 26 members, which included two team Search and Rescue Dogs Association dog handlers. “Because of the critical nature of the incident, team leader Steve Penny requested that additional volunteer mountain rescue resources be deployed and Border Search and Rescue Unit was called out to assist with numbers. “In total 43 members from both teams were involved by the end of Thursday. Mr Penny, who co-ordinated the three teams’ efforts said: “This was a difficult operation for everyone involved but I would like to specifically thank all the members of the mountain rescue teams who were involved over the two days of searching. “We are very grateful for the support we received from our colleagues in both Border Search and Rescue Unit and Ochils Mountain Rescue Team. “In addition I would like to thank the dog handlers from the Search and Rescue Dogs Association who were involved. 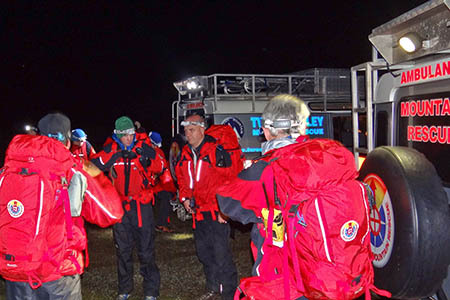 The huge effort of the mountain rescue volunteers would not have been possible without the additional support of family, employers and colleagues who indirectly supported the search efforts by enabling team members to attend the search. Mikaeel’s mother Rosdeep Kular has been arrested in connection with the death of the three-year-old. The 33-year-old is expected to appear in Edinburgh Sheriff Court on tomorrow.